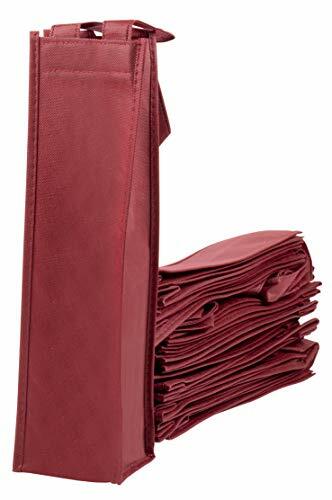 These reusable, non-woven wine bags are excellent for carrying wine bottles and sending wines as gifts. The dark red color makes it perfect for classy occasions like weddings, anniversaries, housewarming, dinner parties, and more. These wine totes are great wine accessories and party favors that you can constantly need. Keep a value pack of 20 and always be prepared for bringing a beautifully presentable gift with you. WINE TOTES: 20 eco-friendly, tear-resistant non woven tote bags for carrying and transporting wine. Each bag can fit one 23.5oz wine bottle. CHARMING GIFTS: Pick up this 20-piece wine tote bag set as a simple yet charming way to give wine bottle gifts to neighbors, friends, colleagues and family members. ECO-FRIENDLY: Each bag has been made using non woven fabric with reinforced stitched edges. They are tear-resistant, durable, and perfect for reuse. MULTI-PURPOSE: Not only for wine bottles, you can aslo carry spirits, craft beers, and more. DIMENSIONS: Each Bag: 13.7 x 3.75 x 3.5 inches; Handle Strap Length: 5.5 inches.